/ Will BREXIT force Change in EU & People Hoard Dollars Fearing the Euro Can Be Cancelled? QUESTION: Marty, your account of Carausius and Postumus being the ancient Brexit is really interesting. Am I correct that whilst this separatist movement failed, it was this Brexit that forced Rome to reintroduce silver? ANSWER: Correct. 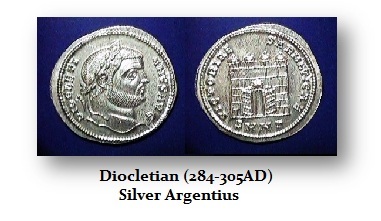 Diocletian introduced the silver Argenteus in 294AD after the defeat of Carausius’ separatist movement. 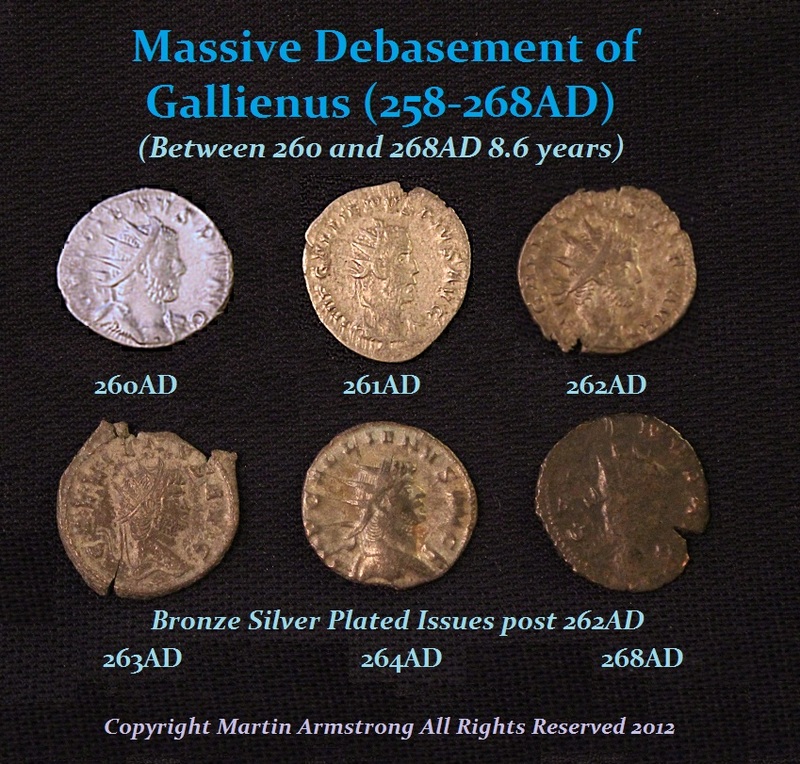 It is highly likely that old silver denarii were still being used at a huge premium. We do find many denarii worn rather extensively indicating that they did see a lot of circulation. Here is a coin of Postumus (260-268AD) and the reverse is a political statement. The reverse side states “RESTITVTOR GALLIAR” with Postumus standing left with foot on the captive barbarian, resting on his spear and raising a kneeling figure of Gallia holding a cornucopia. This is portraying him as the great restorer of order and savior of Gaul. This goes directly to the political instability emerging. His rebellion was by no means an attempt to seize the empire but to split from Rome and establish the Gallic Empire. This is where the coinage PROVES a very important point. The debasement we see in the coinage of Rome clearly created a CONTAGION. 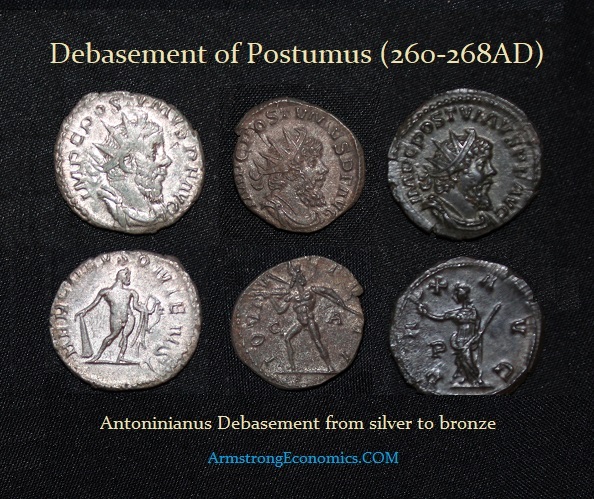 Even though Postumus split creating a separatist movement with the Gallic Empire, he could not maintain a silver standard for the coinage he would strike simply vanished from circulation as was the case in Rome proper. Consequently, we find that the coinage of Postumus shows that he too had to debase the coinage keeping in line with the debasement in Rome under Gallienus. The silver was being hoarded even within this new separatist movement. 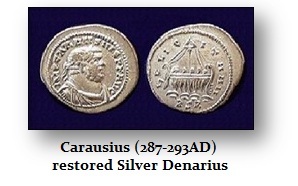 However, when we look at the second Ancient BREXIT movement 14 years later, things did calm down and confidence was beginning to return for Carausius issues a silver denarius and then Diocletian is compelled to follow in 294AD with the re-introduction of silver coinage known as the Argentius. The most interesting aspect of this is that here the Second Ancient BREXIT influenced monetary reform in the Roman Empire working in reverse. 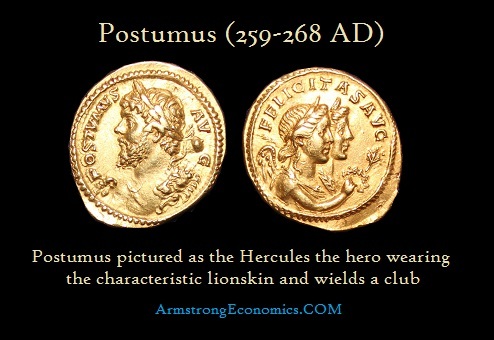 The first reign under Postumus separated when the coinage was still silver. So the debasement in Rome compelled the same response in the Gallic Empire. The Second Ancient BREXIT takes place post-debasement and it issues a silver denarius to prove it is prosperous there in Britain. Thus, the influence moves back the other way. Therefore, the sequence matters. What this demonstrates is that if Europe cancels the currency and moves to its own cryptocurrency as the IMF is suggesting, people will then immediately begin to hoard the paper currency of the USA, Scandinavia, Switzerland, and perhaps even China. This could result in forcing other countries to move to cryptocurrencies to control capital flows. This is NOT what I hope for. If we can get just one country to adopt our solution of eliminating debt, this will put pressure on everyone else to follow. The danger cryptocurrency introduces is OFF THE CHARTS!. The sales pitch has been that they will bypass central banks. In reality, when government outlaws private cryptocurrencies and compels people to use the official cryptocurrency, then the global capital flows will be threatened profoundly. All I can do is understand the economics of the situation and hope for the best.